I just finished the newly-released book The Grand Rebbetzin: Vignettes from the Life of Rebbetzin Basha Scheinberg A”H, and I TOTALLY loved it. 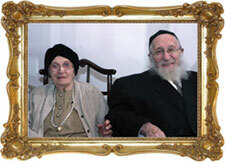 This book was written by Rebbetzin Scheinberg’s long-time friend and caretaker, Nechama Switzer, who interviewed dozens of the Rebbetzin’s family members and friends about the Rebbetzin (the wife of Rabbi Chaim Pinchas Scheinberg, the Rosh Yeshiva of Torah Ohr and Jerusalem’s Mattersdorf neighborhood.) What a true inspiration to read about this great woman who 100% dedicated her life to Torah and acts of kindness. I took classes many years with her daughter, Rebbetzin Altusky – the apple does not fall far from the tree. She’s such an inspiration.